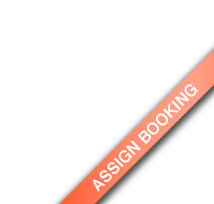 The note "Assign Booking" appears in the lower right corner of the reservation schedule. A booking that could not be assigned to a rental unit was transferred from the online systems or from the channel manager. Such a booking can be created if a room of the desired category was available for the guest for the entire stay, but not in the same rental unit, so that you either have to reorder the bookings in the corresponding room category or the guest has to move. Filter the booking list by "Bookings without rental unit". The unassigned bookings are now displayed. Open these bookings and assign them to a rental unit.